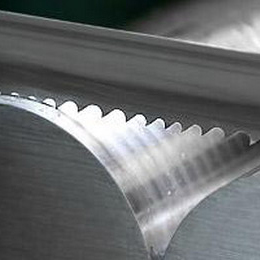 Bimetal bandsaw blades cover the broadest range of sawing applications and materials. 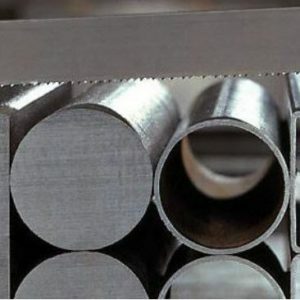 Bimetal blades, also known as M42 blades, are cost effective, high performance, and have excellent fatigue life. The high quality industrial and residential saw blade combines the flexibility of a spring steel backer with the wear resistance of an M-42 high speed steel tooth. Bimetal bandsaw blades for metal cutting are designed to cut a wide variety of materials including, but not limited to: carbon steel, tool steel, structural steel, stainless steel, pipes/tubing, die steels, angles/flat stock, and other mixed metal applications. Our knowledgeable, personable, staff is always available to assist in choosing the perfect blade for your application. If you have any questions, check out the Bi Metal Blade FAQs, give us a call at 877-421-3636 or fill out a Contact Us Form. 95% of companies and individuals cutting the above materials use M-42 bi-metal band saw blades. 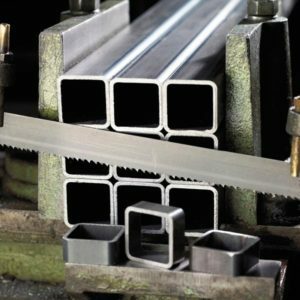 Steel service centers, small to large manufacturers, fabricators, maintenance shops, job shops, tool and die shops, and anyone interested in saw cutting a broad range of shapes, structures, and solids. Bi-Metal bandsaw blades feature: An oversized blade width to increase beam strength, an M-42 high speed steel tooth to improve wear resistance hardened to 69Rc, and a variable tooth pitch. A variable tooth pitch is a very popular tooth form designed to reduce cutting vibration and increase the speed of the cut. This is accomplished by alternating a variable amount of teeth on the band saw blade on every inch. 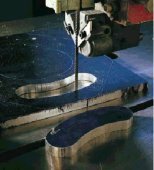 The variable pitch is particularly effective when cutting odd shaped materials liable to produce vibration. Vibration in the cut will significantly shorten the life of the band saw blade. A variable tooth set will also help reduce tooth strippage that occurs when saw cutting hard materials. 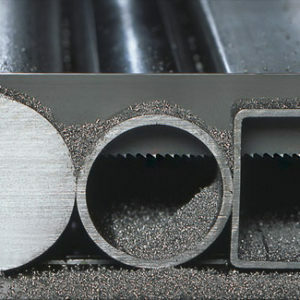 The bi-metal band saw blade tolerates the occasional improper band speed and feed that can be associated with the inexperienced saw operator. Please refer to our sawing reference section on our web site for technical assistance, or contact us directly for immediate help.